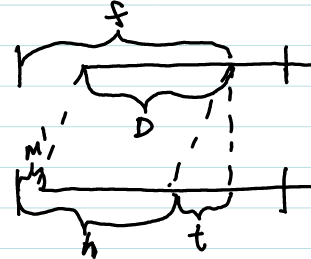 In which I discover how to correct for things moving around when you zoom, using only elementary algebra. Text Collector uses a pinch-pan-zoom view to let people preview how their messages will look in pdf format. Inexplicably, Android provides no pinch-pan-zoom view built-in, so a quick look online reveals implementations to fill that gap littered everywhere. Those that aren’t broken, however, can only handle ImageView content. If you need pinch-to-zoom for something other than pictures, you need to reinvent it. I struggled with this implementation for an embarrassing amount of time, and judging by the number of wonky zooms I’ve seen in Android games, I’m not alone in finding it tricky. Android does give us ScaleGestureDetector to detect pinches; it reports a “scale factor” that is a ratio representing how far our fingers move apart or together. The obvious thing to do is to scale your content, using View.setScale(), something like setScale(getScale() * scaleFactor). That’s the right idea, but insufficient. Scaling a view transforms it around its “pivot,” an arbitrary point somewhere in the view. What we really want is to scale it around the “focus” of the zoom, that is, the bit of content between our fingers. Focus and pivot don’t line up, so, as we zoom, the content we want to see rushes away offscreen. We have two different coordinate systems because we need a fixed-size touchable area to detect fingers and a changing-size area to display content. I call these the “window” and the “content,” respectively. As reported by Android, focus is in the window grid and pivot is in the content grid. Misaligned pivot and focus cause scaling to shift the view content away from wherever it’s supposed to be after the zoom. To correct, we need to translate back by an amount . Actually, the scale factor and focus used here are approximations that work well, but could be refined in a more complete model. When scaling, measurements in the content grid do not change. Upon reflection, this should be obvious because the content can draw itself without knowing it’s been zoomed. So, even though it looks like grows in this diagram, remember this diagram shows the window perspective. From the content perspective, does not change. Android gives us but we need to calculate for ourselves. Since and are in different coordinates than we cannot say that . This makes me wish for a language like Frink that attaches units to numbers. You actually can add measurements of different units together, but only if there’s a defined conversion. So, something, like could do something sane. In Java and all mainstream languages, numbers are unitless, so it’s easy to add numbers nonsensically. Given these things, we need to solve for , the translation that will rescue the content we want to see from wherever it went during scaling. It is important that even though we call a View function, setTranslation(), on the content to translate it, the number we pass that function is in window coordinates, not content coordinates. So far, the things we know, given by the Android api are , , , and , from which we know how to calculate and . Next, we need , the margin after scaling. In software, you don’t actually have to calculate yourself. You can setScale() then getLocationOnScreen() to ask the view where it would place its corner, but that’s cheating. : position of the pivot, , in the window grid, that is, . To make this Android-executable code, we just need to translate to Java and do the same for each axis. Source is on Bitbucket. I didn’t go this far because it’s no cleaner in Java, but does look more symmetrical in Math: tantalizingly like a dot product. Unfortunately, I forgot most of my linear algebra long ago, so I have no idea why. Best go watch 3Blue1Brown. It’s been popular for some years now to say that tests are “executable specifications.” I think this is a wrong way to to think about programming and leads to buggier programs than the traditional view that tests are tests. Programs are three-legged stools that stand on the trio of specs, tests and program code. Stable programs require that each leg receives equal care. When done well, a useful tension between specs, tests and program code improves quality. The form and labels can vary: specifications can be formal requirements or notes in a bug tracker; tests can be automated or manual. Whatever the form, every program has these three parts. Assume that you can write tests in a style where they describe what programs should do. Or, equivalently, assume you can write specifications as executable code that can verify compliance. When so written, specs and a tests serve the same purpose. Thus, by the principle that you should eliminate redundancy, they should be the same thing. The first problem with this argument is that there’s no real basis for believing that you can write specifications in executable language as clearly as if you wrote them in natural language. Things like using describe... it... and expect(x).toBe(y) (instead of assert x == y) superficially make program code look English-like (if you squint) but it’s not at all obvious that they make things more clear. If this style really is more clear, why are tests special? Why not write all code in quasi-English? By a dubious appeal to Whorfianism – the idea that words we use affect what we do – behavior-driven style supposedly encourages people to write tests more declaratively because you “describe” what the program should do. It is true that programs are nearly always more understandable when written declaratively than rather than imperatively, but again, there is no reason this should be specific to tests; all program code should be written as clearly and declaratively as possible. Even if we assume that somehow we can write executable language as clearly as natural language, it doesn’t follow that we need only one or the other. We justify combining test and specs because “redundancy is bad.” By that logic, however, we don’t need test-specs to be separate from program code either. If the specification is executable, it doesn’t need to be the test because it could just as easily be the program. And then there was one. In a sense, you truly can combine tests, specs and program. A program with unwritten program code is nothing but an idea. A program with unwritten tests and specs, is still a program. It’s just not a very good program and we know why. [When programming] one must perform perfectly. The computer resembles the magic of legend in this respect, too. If one character, one pause, of the incantation is not strictly in proper form, the magic doesn’t work. Automated tests are programs too and just as capricious. A thorough test suite must often be as large as the program it tests and, therefore, will have as many errors. Moreover, programs are notoriously hard to change without breaking, which brings us to the second major flaw in the logic behind combining tests with specs. It’s true that tests exist to verify conformance with specification, but that is not the only reason; tests also verify that changes don’t break things. In step one, if you check that the test fails in the way you expect, you know that it tests the code you wrote in step two. Then back away. So long as you don’t change the test, you can be reasonably sure it’s testing for the intended problem. The benefit of a specification, by contrast, is that you write it before you write the program. It clarifies the problem and the goal and forestalls misguided coding. Specs also will be incomplete and sometimes plain wrong, because writing a flawless description of program is as hard as writing a flawless program. So, to remain relevant, specs must change as programs change. If your specs are also your tests, not only will they be incomplete and wrong at the beginning, errors introduced by the changes will make them wrong in different ways at the end. I still hope for executable specifications though I think “property-based” testing is a more promising avenue than “behavior-driven.” However they come, executable specifications will arrive – at latest, computers will learn to understand English better than humans – and even then, specifications cannot replace tests. The role of “hope” in this scenario is played by something often called “Data Bindings.” The problem with this design is that it’s an obviously bad idea: by keeping a Model like this, you’ve created a cache and cache invalidation is known to be a hard problem. You’ll say you need these Models and Bindings because modern. You’d be partly right. This does make me ornery, but let’s step back and look at what might be the number one killer of program maintainability: mutable state. A graphical interface is nothing if not a big pile of mutable state and the job of its programmers is to wrangle the ways it mutates. In a sense, every useful program needs to grapple with this problem. Programs that lack persistent data or ways to display it are pretty useless, in the way that a tree might fall but nobody knows whether it makes noise and most people don’t care. I advocate that you scrap the client-side Model, but I don’t claim this will make your webapp easy to write. No matter what, you’re dealing with a pile of mutable state and that’s bound to be tricky. Why make it trickier than necessary? You really do need widgets on the screen: checkboxes that can be checked, or not, spans that could say one thing, or another. Do you need a shadow copy of those things as well? Now, not all state duplication is called a Model and not everything called a Model is state duplication. Elm, for example, takes the view that Model is the application state but avoids state duplication by virtue of being purely functional. Most programs aren’t written in purely functional languages, so the Model is state duplication, but users don’t see Models. They see widgets and to them, the state of the widgets is the state of the data. In a programmer’s ivory tower, you might argue that the Model is the source of truth, but your arguments matter not at all to actual people. So don’t fight it. The path to enlightenment lies in realizing that once you’ve rendered the data, it doesn’t matter anymore. Throw it away. Wait, that might work for your Web 2.0 site and its DHTML, but I have a Web APP. It’s modern. It has a span over here and a checkbox over there and the span says ‘frobbing’ or ‘unfrobbing’ depending on whether the checkbox is checked. Well, it’s not just this one span, this blink tag over here needs to appear if you’re not frobbing. With your plan, I need to add another line of code to handle that. True, but you’d have to add something when backing it with Models and Bindings as well. It wouldn’t be less code, just different code and more indirection. There are more ways frobbingness can change though. I don’t want to copy this logic in every place. And well you should not, but you already have the tool to solve that problem: a function. Move the interface update logic to a function and call it anytime frobbingness changes. I see what you’re saying, but I don’t like it. The span and the blink are in logically different components. I’ll end up with a bunch of functions that update both, but don’t sensibly belong to either. That’s a very good point. Partly, the appeal of the client-side Model is that it seems we ought to be able to bind all the widgets to the same object, giving us a kind of fan-in-fan-out approach to updating them. In principle, you’d have just one Frobber and you’d change its isFrobbing property, then all the dependent widgets would get notified. People have been trying to implement this concept since the invention of the computer and it’s gone by many names. Recently, the buzzword is “reactive” programming. This idea can work well in some systems. Spreadsheets and style sheets are examples of very successful reactive programming models, for example. It works well in limited domains with declarative or purely functional languages. Now which copy of Frobber number 1 is the true Frobber? Ideally, you’ll make them point to the same object so it doesn’t matter. Your Binding magic may or may not be able to make sense of that arrangement and the temptation to duplicate data is strong. Models and Bindings just moved the concrete problem of what appears in widgets to the abstract problem of what goes where in the invisible Model. With or without magic Models, as the application grows, you’ll need to put things in sensible places and call them in sensible ways. That is the whole job of user interface programming. If you keep doing this for all the data and all the widgets in your app, you’ll notice you keep doing the same kind of tedious things over and over. This thing over here updates some data. Need to show it over there. Where’s the right place to put that code? Here, there, somewhere else? Decide, repeat. Naturally, as programmers, we think we can automate away the repetition, but some complexity is fundamental. Author Josiah UlfersPosted on May 31, 2018 October 5, 2018 Categories Programming, User InterfaceTags model, User InterfaceLeave a comment on Do you need a Model? In these examples, “joe” is my username. The “s” in “schroot” stands for “securely,” but it might as well be “simple” because “schroot” handles fiddly bookkeeping tasks for setting up your environment, based on its config file. Normally, schroot mounts /home from the host as /home in the chroot. I don’t want programs in jail to muck about with my home on the host though, so I edit the setup.fstab option. Its default lives in /etc/schroot/default/fstab. Finally, enter the chroot, as root. From here I can install npm in relative isolation; this is not sufficient for isolating malicious software, but it’s a nice way to avoid inconsiderate programs from pooping all over your system. How many bugs does it really catch? Only a few. Rules against unused variables can be useful when you’ve renamed something in one place and forgotten another place, for example. Trouble is, I’ve only noticed lint catching bugs in code that wasn’t complete or tested anyway, and therefore already broken by definition. But is it worth bringing in lint for the few bugs it can find? I think not; the better approach is simple: learn to use strict reflexively. Then spend the effort you were going to use typing semicolons on testing instead. So what? Consistency for its own sake is a pursuit of feeble minds. In writing, particularly writing computer programs, consistency is a proxy for something much more important: readability. And readability is not something that computers yet understand well. It is perfectly possible, common, in fact, to write incomprehensible code that passes a linter. We went from the ultra-rigid linter, to the ultra-configurable, to the ultra-pluggable. At each step, we introduced more and more time-consuming opportunities to argue about picayune issues. Lint is such a temping distraction because it feels like work, but it isn’t. When you’re arguing about lint rules or fixing lint errors, you’re editing code, but you’re not getting things done. So should I never lint? All that said, I recommend lint for one purpose: it can be a useful way to learn about the idioms and pitfalls of a language. Run your code through a linter and learn why it complains. This use of lint as a teaching tool is actively discouraged by the way most people advocate using it. Imagine you set up a hook that says “all code must pass lint before commit.” Those who actually could benefit from the lint suggestions are blocked by them, thus encouraged to “fix” the “problem” as quickly as possible: obey the tool and never learn why. As far as I know, this comes from Bourne shell. In the weird world of shell scripts, it actually turns out to be useful, but in the more structured world of most programming languages, it has approximately zero real-world use cases. Single quotes should be interchangeable with double quotes. Interchangeability allows you to use the easier-to-type single quotes most of the time, but switch to double quotes for easy single-quote escaping. Multiline strings are a Good Thing but they usually end up implemented just a little bit wrong. Thus, when we find ourselves typing a string literal and the line gets uncomfortably long, the language makes us go back to the beginning and change delimiters. Vice versa when shortening strings. puts do_stuff() # "\n    hello\n    world\n    "
What are those leading spaces doing? I can’t think of a time when I’ve ever wanted a string literal to maintain its source indentation at runtime. So there are many use cases where trimming and dedenting is warranted, but almost none where it hurts. CoffeeScript almost got both aspects right, but it makes a distinction between “multiline strings”, that use ordinary quotes and “block strings,” which use triple-quotes. 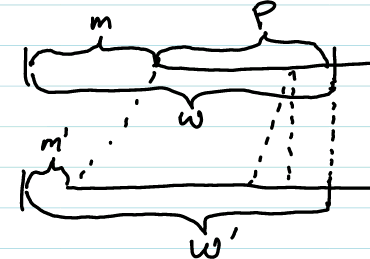 Ordinary strings collapse line breaks to single spaces, triple-quoted strings trim and dedent correctly. Next time: the perils of such subtle distinction in quote style. Previously, I described a Gradle script that handily generates release version codes for Android apps. The generated version codes take the form [date][number]. I finished that article with a litany of Gradle bugs. Today: fresh Google bugs! In May, Google added automatic crash reporting to the Google Play developer console. Before auto-reporting, users had to explicitly send reports when apps crashed. So far so good, but if you’re testing on a physical device, you might notice something alarming: reports of bugs you already fixed, or crashes you only saw in development. Apparently, Google forgot to filter out reports from debug-mode applications. Perhaps Google would claim this is a feature, but it means that you can’t tell which crashes are actually happening in the wild. // release builds, odd-numbered version codes are debug builds. MAX five releases per day. It’s subtle, but at least now we can tell which crashes actually happened to people using your app: they are even numbers. It appears that Google stores the crash data on the phone and reports it only once per day. The version code it reports is the version running on the phone when it sends the report, not when the crash actually happened. If the app updates in the interim, we can still get crash reports for bugs already fixed and they will seem to come from a version that includes the fix. I don’t know of any workaround.